The prototype Cave "Tight Ar$e" arrived by post today, it's a great looking little unit with the only control being a switch for 1 pole or 2 pole, Heath will have to inform us as to how much cut these two settings provide. Here is a quick photo of the unit and I will supply an in depth review and a YouTube of the unit on the weekend. This thing has become an indispensable tool and is always in use or in my gig bag just in case. 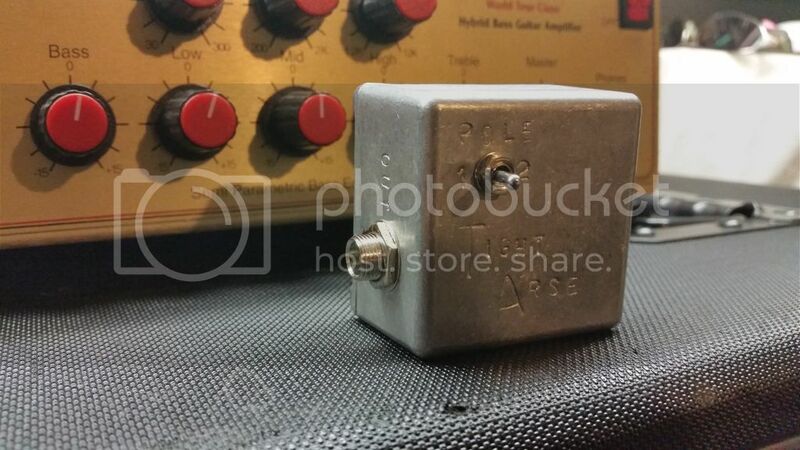 Perfect for taming an overly boomy room or as I used it recently, in the effects loop of an amp I had to loan to a friend for back line at a festival. This was my insurance policy in case somebody decided to run the amp flat out with the bass maxed out. Dose it change your tone? 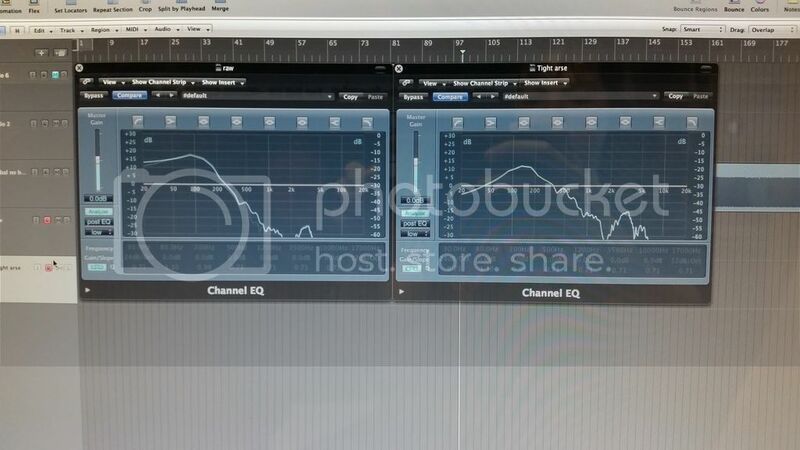 Yes there is a slight drop in the ultra low frequency's which is audible but has the effect of tightening up the low end and making it sound more controlled. How I usually run it is to plug it in line just before the amp then adjust my tone to suit, it works a treat. The unit Heath sent me has a switch to change from one pole to two pole, the one pole setting is just about right for most situations and I have recommended to Heath that this switch is not needed as two pole is too drastic of a cut. 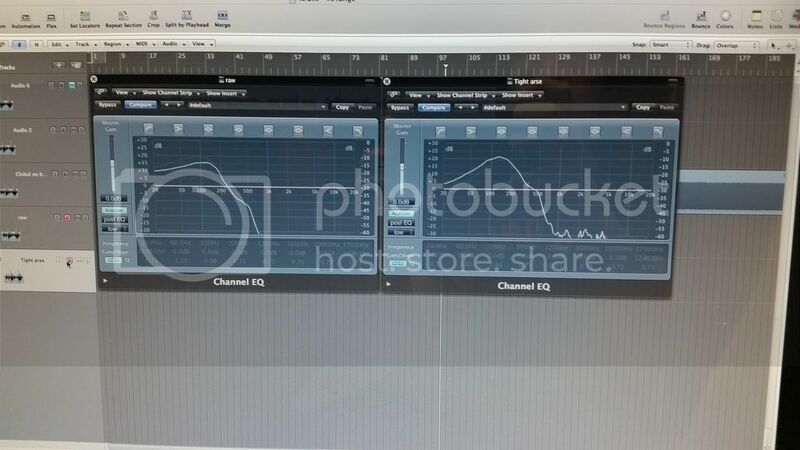 Below are some pics I have taken with this plugged in to Logic, on the left is the raw signal straight from the bass and on the right is the signal through the Tight Ar$e. The fist pic is one pole and the second is two pole. I'm certainly keen on one of these! Any news on what's happening with them? I'd requested a kit ages ago but haven't seen anything since the original thread. Heath has been out of action for a little while but I have chatted to him recently and he is about to get back in to it again. bobbybdazzler wrote: Heath has been out of action for a little while but I have chatted to him recently and he is about to get back in to it again. Goodo - thanks for the update! I won't be making any other pedals (or kits), other than this one, at the moment. This unit is very simple. Other than a pre-drilled, stamped aluminium casing and a couple of jack sockets, there's a one pole HPF section comprising of two components. All I did was work out the best values for each of the components. Very simple. So, for those of you in the know, build one yourself. You could even have two or three filter orders with buffers and a transparent booster to pick up the losses. Or buy the two components and solder then into your bass, at the jack. Costs nothing at all! Now, here I thought that by now you'd be blorf-proof, Eden. It's good to see that Heath is helping to keep the blorf at bay. New 3-word slogan (for all you LNP members out there ) STOP THE BLORF!